Pictured at Friday’s check presentation are Don Sanders, Staci Weller, Mike Melvin, Bill Bean and Steve Hess. The Gloria Theatre is capable of hosting cinematic digital movies as well as live performances and religious presentations after a renovation of its interior during the past few years. 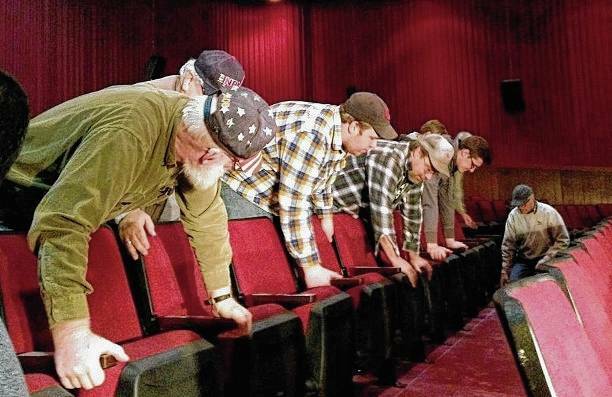 Volunteers are shown in this file photo renovating the former Urbana Twin Cinemas seats to suit a one-screen theater. 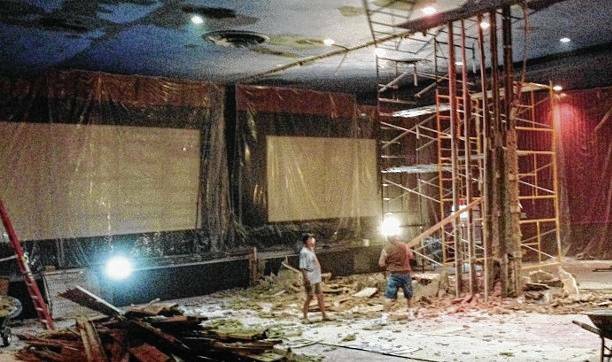 In this file photo, volunteers take down the wall separating the two screens during renovations at the Gloria Theatre. GrandWorks returned the twin cinema formerly owned by Chakeres Theaters to one large screen, making it possible to show the most recent movies on the market the way they were intended. This undated photo shows the Clifford Theater of the early 1900s. The third floor was destroyed in a fire in 1919. 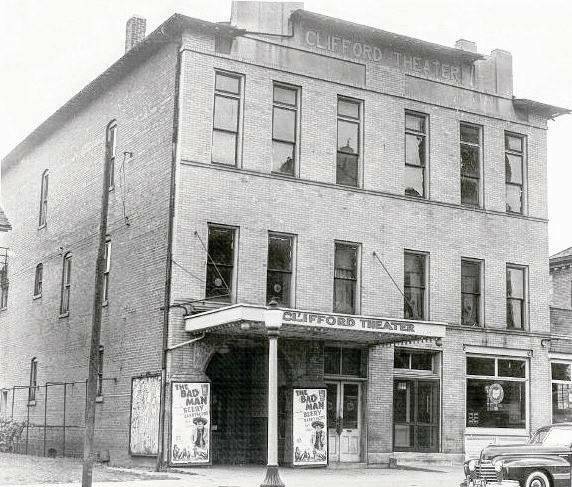 The Clifford was later purchased by industrialist Warren Grimes, who renamed it the Gloria Theatre after his youngest daughter. An ambitious community project that began in 2014 came to fruition Friday evening. When the Urbana Twin Cinemas closed for business in 2013, much uncertainty surrounded the future of the theatre located at 216 S. Main St. Its roots began in 1904 when it was opened as the Clifford Theatre by Urbana native William Shyrigh, known by the vaudeville stage name Billy Single Clifford. Decades of damage and cultural changes wore on the facility and it fell into dormant decay after a 1919 fire when Clifford could not afford the necessary repairs. The theatre enjoyed a mid-century rebirth courtesy of Urbana industrialist and philanthropist Warren Grimes – who renovated it in honor of his youngest daughter Gloria and turned it into a community destination for Hollywood’s top movies with a grand opening on Christmas Day, 1941. For 26 years, the Gloria Theatre was the entertainment hub of the community as it hosted community events and local talent. During World War II, thousands of residents viewed the frequent news reels reporting recent victories and troop movements in the war. The renovation investment by Grimes would be about $2 million in today’s dollars. After the Grimes golden era, the theatre sold to Chakeres Theatres in 1966 and operated in a corporate phase that lasted nearly 50 years before Chakeres closed the doors in 2013 due to adverse pressures from modern competition. Sited in a key location near the downtown, the theatre’s closure was a major loss. The Urbana United Methodist Church (UUMC) congregation voted in 2014 to buy the theatre with a vision for it to be used to “reach, restore, and revive the Champaign County community culturally, socially, economically and spiritually,” according to information compiled by the church. The GrandWorks Foundation was created as an independent nonprofit organization to carry on this mission. The foundation, directed by a 13-member board of directors, brings together city and county government, local arts organizations, area schools and universities, small business owners and faith-based organizations. 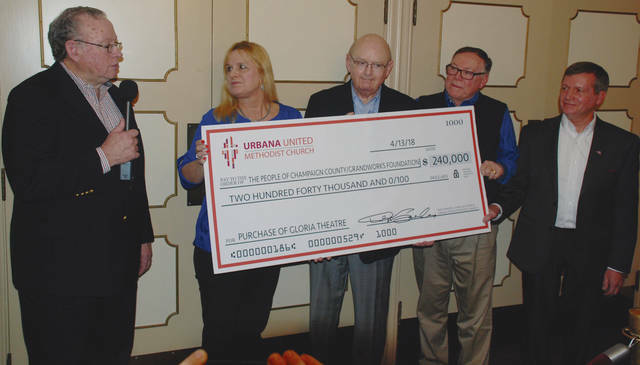 On Friday, the UUMC made the final payment on a $240,000 bank note to buy the theatre and presented a ceremonial check from the UUMC to GrandWorks, gifting the Gloria Theatre to “the people of Champaign County.” The event marked the second time in its history the facility had been saved by timely philanthropy for the benefit of all. Don Sanders, chairman of the UUMC Administrative Council, was joined by other community leaders for the presentation on Friday evening. Sanders presented the check to Mike Melvin, president of Perpetual Federal Savings Bank, which loaned the church money to buy the theatre. Also in attendance for the ceremony were Staci Weller, executive director of the GrandWorks Foundation, Urbana Mayor Bill Bean and Champaign County Commissioner Steve Hess, representing the community. “I am often asked why our church bought the theatre and my response often shocks people: because God called us to step out in daring faith to embrace a community treasure that God will use to reach, restore and revive our community for His glory,” UUMC Pastor Jim Lillibridge stated. The GrandWorks Foundation is directing a four-phase plan to raise funds and complete the facility improvements, supplementing more than 12,000 volunteer hours donated since the project began in 2014. Reopening the facility as the Gloria Theatre was phase 1 as the two-screen cinema was transformed into one large auditorium with a stage for live events and a new 40-foot screen, 4K digital system and 7.1 Dolby surround sound for showing new movies. 2. Patron care improvement, including addition of services, operational improvements and infrastructure renovations. 3. Capacity expansion to enable use of all floors and levels of the building. 4. Large production capability, to expand and create usable space for large concert and theatre productions. 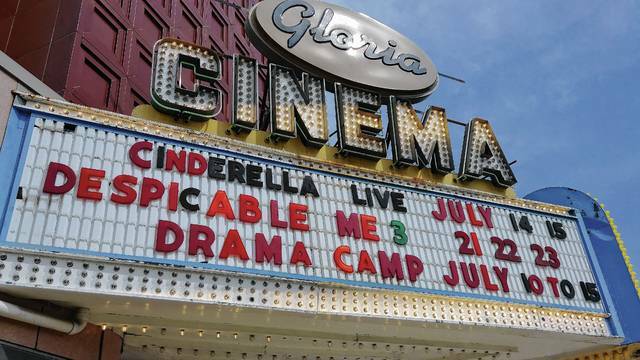 In 2017, the Gloria showed family-friendly movies to more than 12,000 people. In addition, more than 2,400 people attended Christian events and the theatre partnered with 15 local businesses, churches, all five local school districts, Urbana University and other organizations to host 22 special events and private movie showings. For more information about the Gloria Theatre and the GrandWorks Foundation, visit gloriatheatre.com. Brenda Burns can be reached at bburns@aimmediamidwest.com.